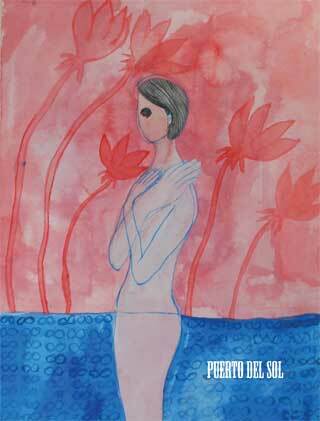 My short story “A Very Wiggly Tooth” is out in the Summer 2012 issue of Puerto del Sol. This story has had an unusual evolution. I began the story during a lull in the novel draft I have just finished (“For the Love of Mary Hooks”). I find it helpful (at least I did this one time) when a longer draft begins to sag in the middle and I need to kickstart the imagination, I work on shorter fiction or nonfiction. The novel demands such a long stretch of a single note that it’s difficult to hold that note through to the end without taking a breath. Working on shorter pieces feels like that necessary breath. So it was that I took advantage of a break in the routine when my wife and daughter left me at home while they traveled and wrote a bunch of short fiction, among them the initial draft of “A Very Wiggly Tooth.” I had the key image for “Wiggly Tooth” in my head for some time–the gin and tonic and lime that opens the story. “It happened when I was seven and losing teeth. I’ve long wanted to tap into what I’ve learned as a father of a daughter–a unique relationship among parental relationships. Like most parents, I suspect, I worry about the million ways in which we fail our children. And by “we,” I mean I. But even the best of parents doesn’t always get it right, for whatever reasons. Yet, our children love us no less for our failures and faults. God help them, they just keep on loving us, forgiving us without even realizing they’re doing so. Ideally, that understanding–our recognition of our own failures and our children’s capacity for loving even the weakest of us–leads to being better parents, better people. In my own obsessive way, each night I recount in what ways I’ve failed my daughter that day. It’s almost always the small stuff–a preoccupation with the computer (“just five minutes, peanut, just one more email to send then…”), a need to sit and listen to the radio for a few minutes, a household or work-related problem to solve, etc. It all boils down to not spending time with her or not spending enough time with her. And that’s all she really wants from me–my time. I wanted to write a story about a father who fails his daughter in much grander ways–as a dysfunctional, drunk oddball whose grief for his lost wife has proven insurmountable. But he loves his daughter and she loves him and they get by on what seems like that alone. The potential for a maudlin story, I hope, is undercut by the daughter’s strong, rambling voice and the father’s not always sympathetic behavior. Originally, that potential was undercut by a zombie–that’s right, the father originally had returned as a zombie because he wanted to make sure his daughter was taken care and knew that he loved her, which she was all right with. I think I just really wanted to write a zombie story. I abandoned the zombie and just made him an oddball, but part of me still feels like this is a zombie story. The wiggly tooth has a different evolution–the photograph above. I took this photograph because I wanted to make sure I never lost the image. My daughter, the losing of her first tooth imminent, wanted to keep us updated on the status of the tooth. 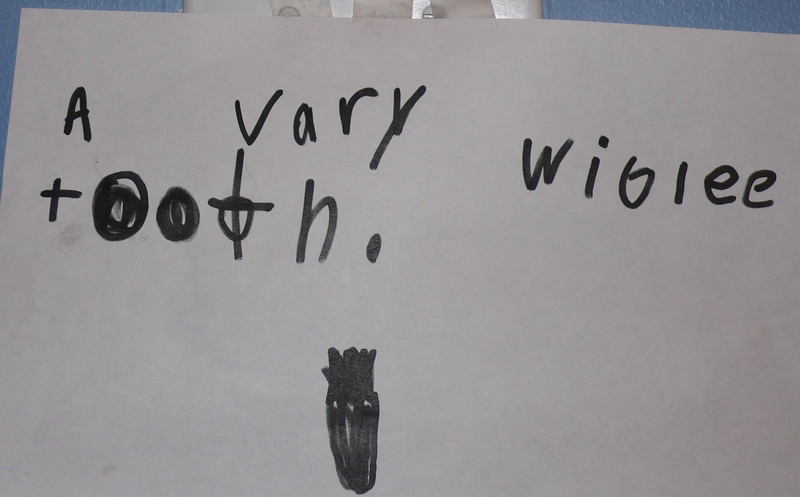 She posted this sign on the bathroom wall to let us know that the tooth was, indeed, “vary wiglee.” I liked the simple posting so much–misspellings, drawing and all–that I left it hanging for as long as it would stay stuck to the wall. Then I took the photograph. The story employs a rambling (lots of long sentences), first-person narrator (the daughter) developing a non-linear story that often recoils on itself and runs off on tangent after tangent, spiderwebbing finally into a cohesive narrative. The wiggly tooth of the title was at first a red herring that never resurfaced after the first sentence. Later, after the zombie father was removed, it made its way back into the story. The story and narrator are both unconventional and will probably drive any reader with a short attention span mad to the point of tossing the journal at a wall in frustration and disgust. For those with more patience, I am hopeful you will find what the editors of Puerto del Sol found–a story of a deeply flawed father and his loving daughter. Next time on Animal Planet: I recall a serendipitous glimpse into the world of cockfighting and the wilds of nature after a weekend of adventuring in the South Carolina low-country.